What are these files? These files are essential for search engines and other web services. They are two out of the five web files that will improve your site. The Sitemap.xml file is a standard protocol for listing all the URLs that are contained within your website. It gives web spiders like Googlebot a better understanding of your website’s structure. If you’re using WordPress, you’re in luck: The only thing you need to do is to install a plugin called Google XML Sitemaps, and it will do all the work for you. This is a valuable WordPress plugin, and is one of six plugins that Six Revisions uses on the site. 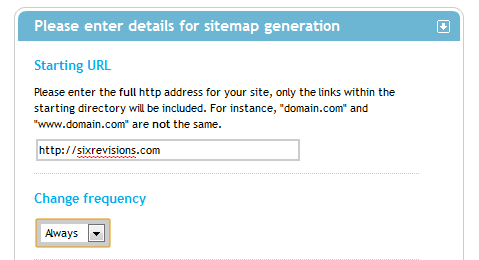 If you’re not using WordPress, you can have a look at XML-Sitemaps.com, a simple tool for generating a Sitemap.xml file just by providing your website’s URL. Robots.txt is yet another file that search engines love. It’s a simple text file containing information about which parts of your website search engines should and shouldn’t visit. To create such a file, you can just use a template and modify it to you own needs. If you use WordPress, check out this guide called Optimizing WordPress for Search Engines to learn more about Sitemap.xml and robots.xml in the context of SEO and WordPress. Having stats about the traffic to your website is simply priceless. Without traffic statistics, you won’t know how many people are visiting your site and you will have a hard time figuring out how to improve your site to draw in more traffic. If you want a top-notch and free application that will report data about your website users, then look no further than Google Analytics. Of course, there are alternative web analytics software out there, but Google Analytics is the undisputed leader, and not simply because it was created by Google, but because the tool is extremely powerful and easy to use. Not many people use this tool — it’s not as popular as Google Analytics, for example — however, it still is one of the best tools to have as a website owner. 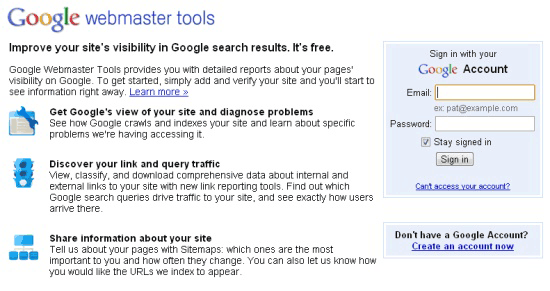 Want to learn more about Google Webmaster Tools? 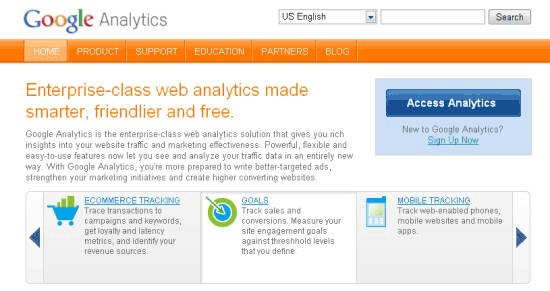 It’s not surprising that the best place to start is the official Webmaster Tools Help articles. Also, make sure to check out the following guide: How to Find and Remove Broken Links in Your Website. This guide will allow you to make sure your hyperlinks work. A good ranking in search engines is important to any site. Good ranking equals more traffic and increased levels of popularity. More traffic equals more money. That’s why it’s crucial to monitor whether or not your SEO efforts are bringing good results. Manually: Just input a keyword in Google Search and take note of the position of your website. Important: Do not click on your listing because if you do, Google will remember it and next time you will see your website on a higher position. However, you will be the only person to witness that change; everybody else will see it on the actual position. This is because Google Search tries to predict what you will likely click on and, thus, previously visited sites bubble up to the top. Use a Firefox plugin: There are a few Firefox browser add-ons for checking your keywords. I like the one called Rank Checker. Rank Checker is easy to use and has all the important features for search engine ranking analysis and monitoring. I don’t really know why, but for some reason Google checks whether your website appears in Dmoz, and if it does, it gets some extra points when it comes to its search rankings. Submitting your website is very easy. Just go to Dmoz, browse to a category that best describes your website, and then click the suggest URL link in the top menu. Unfortunately, it takes some time for your submission to be reviewed. Sometimes even a couple of months. Here’s something important: Even if you don’t see your website listing yet, don’t resubmit it. Such a practice may result in your website dropping to the end of the line. I would suggest not resubmitting your site more than once in a 6-month period. Google Alerts is brilliant. Let’s say that you’re interested in all things that have to do with the term, guitar. If that’s the case, then you probably want to know about every new website that appears on Google that covers this topic. However, you can’t possibly monitor the whole internet (it’s a pretty huge place). Here’s where Google Alerts comes to the rescue. Google Alerts will notify you about every new web page that contains keywords you’re interested in. If you don’t see the power behind this nifty app, then let me rephrase my value proposition for Google Alerts: Google will let you know of any web page that contains your keywords. This lets you stay on top of competition, as well as monitor what people are saying about your website. Talk about having your finger on the pulse — it doesn’t get much better than that. There are many more tools for monitoring your website’s mentions. For example, you can use the RSS feeds of places like Yahoo! Pipes, Twitter search and Google Blog Search. Without a doubt, the most important piece of information you can have about your website is if it’s online or not. The problem is that you can’t really visit each of your websites every minute of the day. Luckily, there’s an app for that. It’s called UptimeRobot. You can use UptimeRobot to track as many as 50 websites at the same time, and if one of them goes offline even for a minute, it will send you an email notification. The best part? The tool is free. There are plenty of tools for monitoring your web properties’ uptimes. 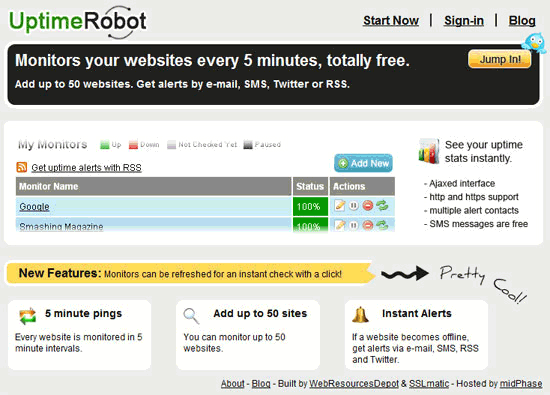 Be sure to check out this list of 12 free tools for monitoring your site’s uptime. It was not so long ago when Google announced that one of the new factors for ranking websites in search engine results is site speed. Of course pleasing Google is not the only reason why you need to make your website lightning quick. Users hate waiting, and they will less likely visit your website again if they remember it as being slow. There are many tools for allowing you to make fast web pages. One such tool is YSlow: it checks your web pages to see issues and suggests things you can do to make your site faster. There are many other tools you can use to check and evaluate your website’s speed; be sure to take a look at this list of 15 tools to help you develop faster web pages. Dealing with all the things mentioned above will take you less than one hour (maybe a little more if you don’t have a web development background and if this is your first site). This hour might very well be one of the most fruitful hours you spend towards the well-being of your new website. What other things should site owners do immediately after launching a website?